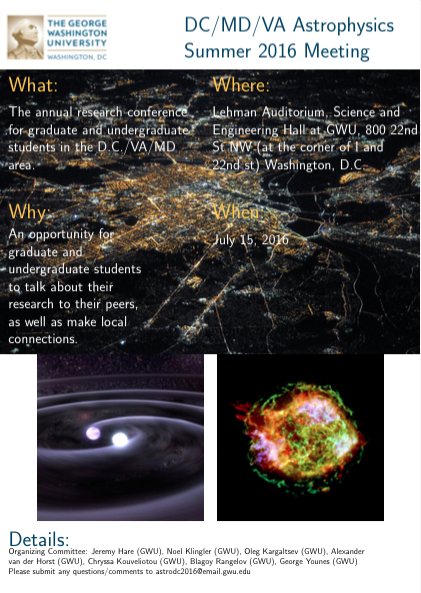 The GW Physics Department and Astronomy, Physics and Statistics Institute of Sciences (APSIS) are proud to host the 4th annual DC/VA/MD summer meeting focused on astronomy and astrophysics research by junior scientists (senior undergraduates, graduate students, junior postdocs). The aim of this meeting is to bring local students and researchers (e.g., faculty, post-docs, NASA researchers) together to interact, network and learn about other's research. Click on the image to download the PDF version of the conference flyer. Graduate and upper level undergraduate students as well as postdocs are invited to submit abstracts to present their research in the form of talks or posters. The format for talks will depend on how many participants register, but will be 10-15 minutes in length with 5 minutes for questions. The exact format will be announced after the registration deadline. There will be 2 coffee breaks and 1 lunch break, during which posters will be presented providing ample time for discussions focused on posters. Based on majority vote in the poll, the conference will be one day, July 15, 2016. We also plan to have several talks on hot modern-day astrophysics topics conducted by senior researchers. 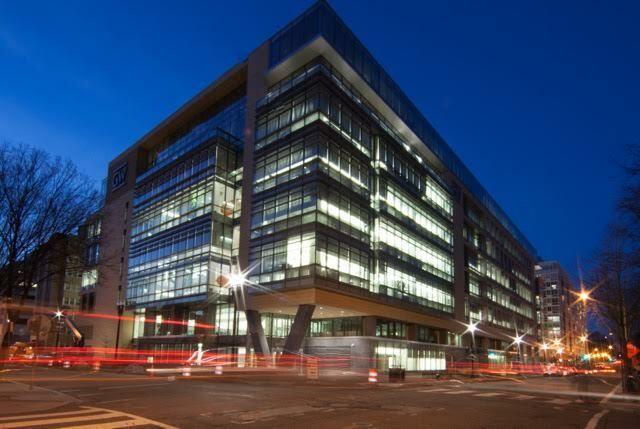 The meeting will be held on July 15, 2016 at the GWU's new Science and Engineering Hall (SEH), the largest academic building dedicated to science and engineering in downtown Washington DC, located at 800 22nd St NW (at the corner of I and 22nd st). 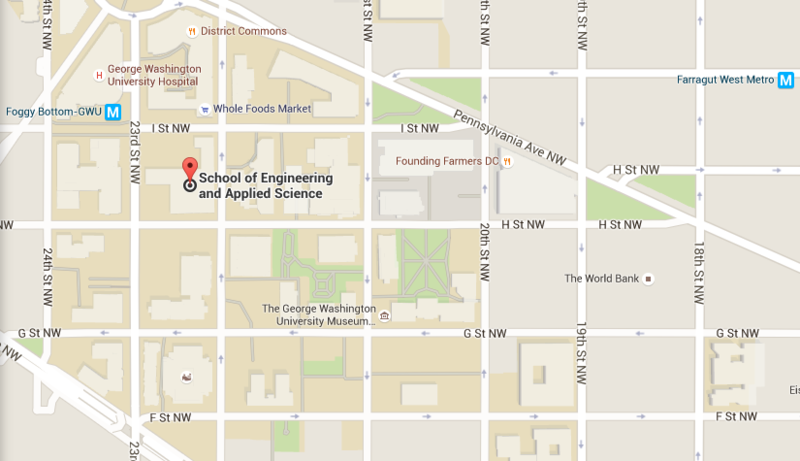 It is easily accessible by metro, only a short walk from either Foggy Bottom (Orange/Blue/Silver) or Farragut North (Red). If you come by car, parking information is available here. The talks will take place in SEH's the Lehman auditorium. The complete conference program is available here as PDF. Jennifer Liang (UMD) Turbulence in galaxy clusters: a matter of gravity? Program of the 2nd DC/MD/VA Astrophysics Summer 2014 meeting also organized at GW is available here. Meeting sponsors: This meeting is supported by the Department of Physics and by the George Washington University and GW Astronomy, Physics and Statistics Institute of Sciences (APSIS).